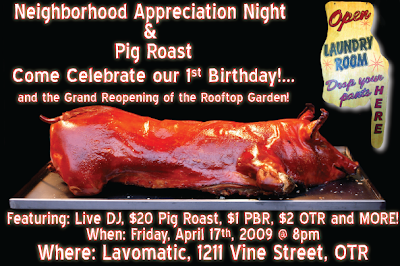 Lavomatic will celebrate its 1 Year Anniversary and the reopening of their rooftop terrace tomorrow night (4/17) with a pig roast, drinks and a live DJ. The urban food and wine bar will offer the pig roast for $20 and everyone’s favorite OTR Ale for just $2. The fun will start at 8pm in the heart of the Gateway Quarter in Cincinnati’s historic Over-the-Rhine. Lavomatic Cafe is located in a former laundromat in a single story building wedged in between multi-story structures on both sides. The rooftop terrace has a great view of the Art Academy and surrounding OTR buildings. The neat thing about it is that the terrace is surrounded by renovated buildings that now boast condos just feet away. If you haven’t yet been to the Gateway Quarter this may be a great chance for you to get acquainted. Come down a little early and go check out the businesses nearby that are all within a short walk and make for great browsing/window shopping.